Want to create a nonprofit website? Here are some amazing and best nonprofit WordPress themes of 2018 to help you out. Creating non-profit and charity websites can be time taking the task. This can be made easy a CMS like WordPress and the available nonprofit themes. WordPress is a best for creating such website because it’s free, maintainable and very easy to use. 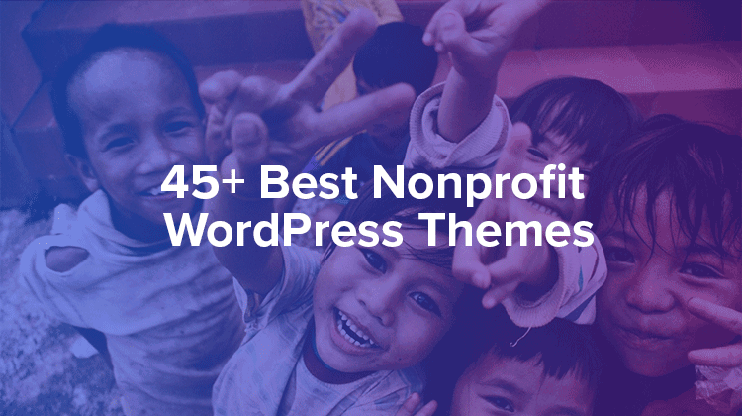 For further assistance, we’ve brought to you this list of some of the best and most popular non-profit WordPress themes. Being specially crafted for the purpose, these themes have the relevant features and design. Most of them come with an inbuilt system or plugin support for accepting donations. Moreover, there is customization possibilities and plugin compatibility for extended functionalities. So, just go through the list and find the one that suits your purpose and get started with your amazing website today. 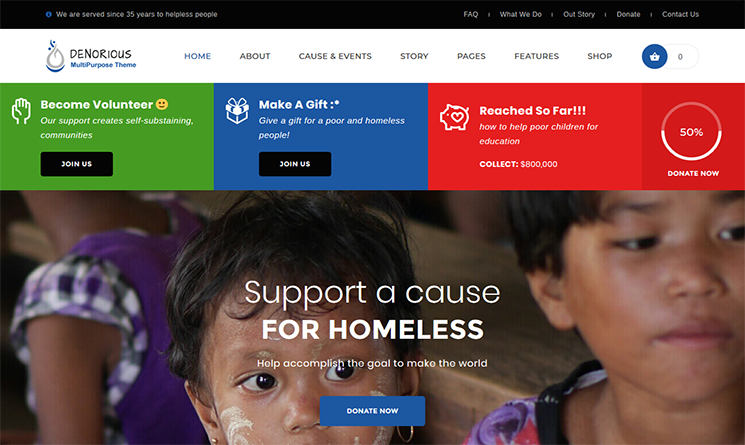 Create impactful charity wordpress website with visual composer. No coading or technical knowledge require. 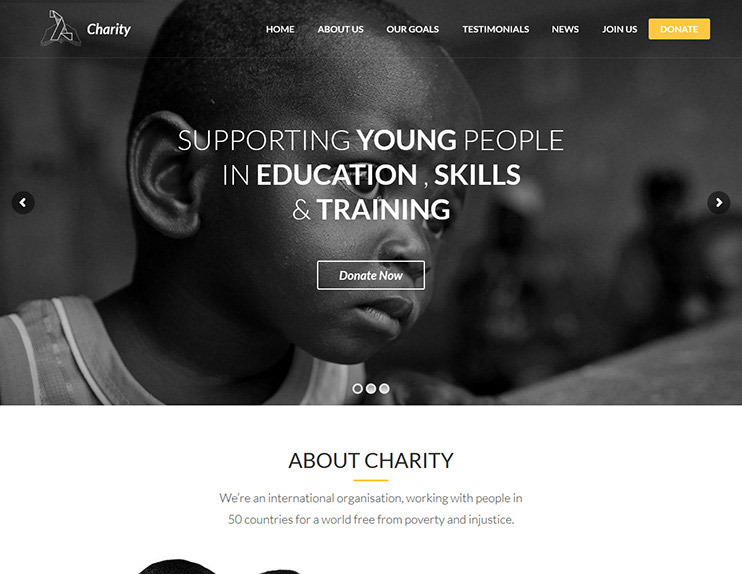 Charity is click and edit WordPress theme with many useful features. 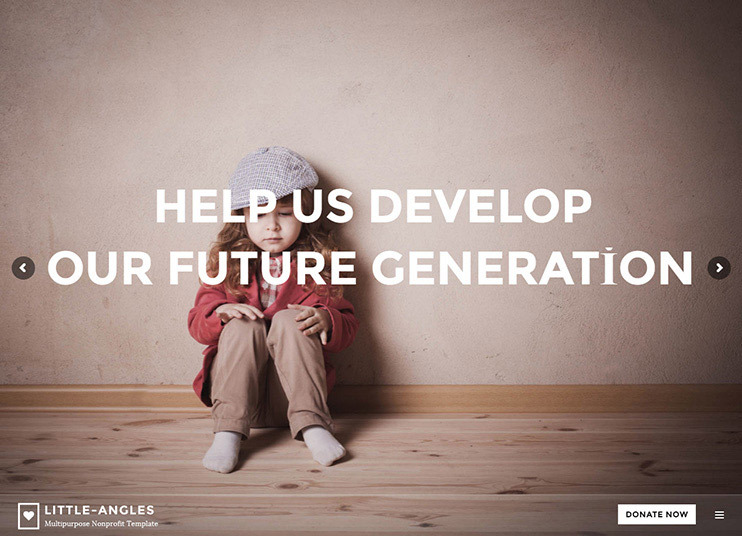 You can create Crowdfunding, Responsive, Flexible website with unlimited Causes/Campaign/Causes. It has inbuilt donation system, Event listing facility and WooCommerce compatibility which let you create online store. PS: Also check out our best WordPress themes for Non-Profit organizations. Born to give is one of the best nonprofit WordPress themes with responsive and retina ready design. The theme also has all the facilities to create, manage and display events. For this, you won't require any extra plugin, the feature is inbuilt in Born to give. It also lets you display the events calendar with events on it. There are 12 predefined color patterns, you can further add your own color scheme too. You can choose from the full-width or the boxed layout of the theme. The theme includes isotope gallery, so you can create beautiful galleries on your site. Besides, there are many other customization options. Built on the twitter bootstrap, the theme is efficient and highly responsive. You can integrate the Visual Composer page builder into the theme, and build the page layouts according to your needs. It is optimized for touch and swipes ensuring a perfect mobile experience. Born to give lets you create a multi-lingual website so that you can deliver your message to people speaking different languages. It also has RTL mode that lets you create a website in Left to Right orientation. 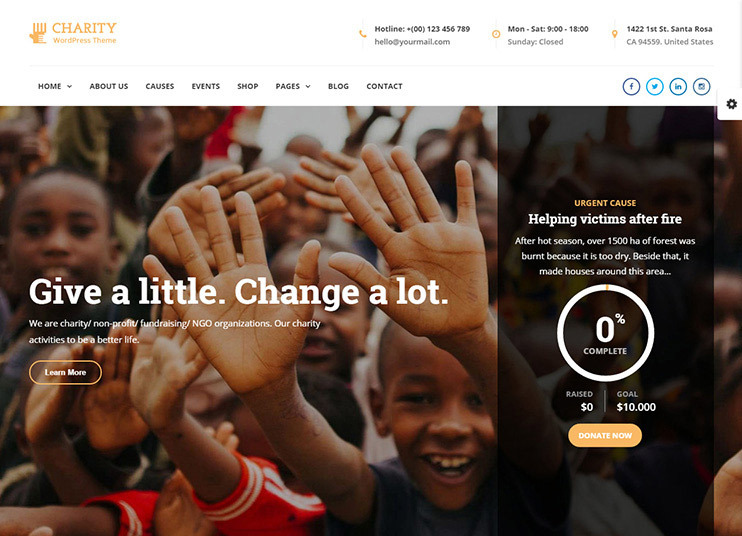 Charity WP is a best nonprofit WordPress theme for fundraising and donation campaigns in 2018. The theme has 6 demos to choose from. Just choose the one you like and install the sample data to get started with your site. The theme is developed after a lot of research and contains all the features that are required for a charity website. With this theme, you can create Charity campaigns and manage them. You can also keep the note of the donation received for the campaign. Charity WP allows data portability if you ever wish to move your data. The theme has options to change the colors, background, and fonts to match your branding. You can show your logo while the page is loading, instead of making visitors stare at the blank screen while it loads. With the Charity WP theme, you can manage events and sell events tickets. If you want to raise by selling something on your website, that too is possible with WooCommerce plugin. Charity WP is performance optimized and SEO optimized. It is compatible with the famous WPML plugin for multi-language translation. It also lets you create a website in RTL mode. 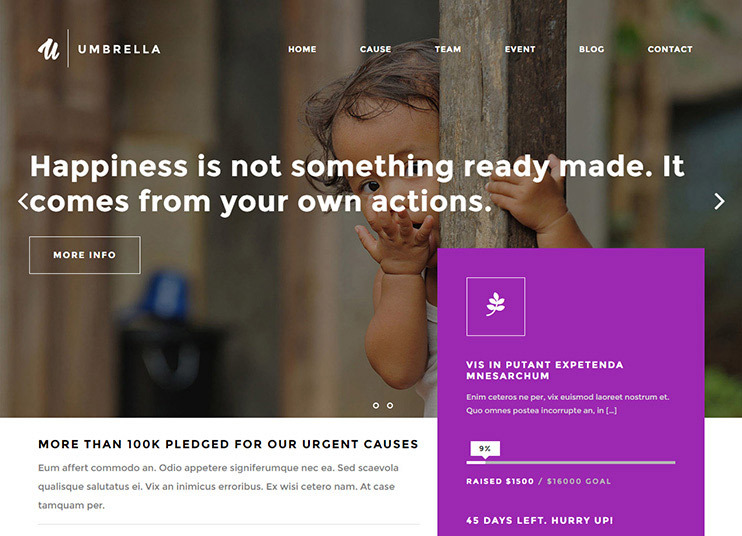 Pena is a responsive and easily customizable charity foundation theme. It has a modern design and is specially made to suit the requirements of a charitable organization. The theme has different page templates and blog layouts. You can select from the front page templates available with the theme. The theme also supports siteOrigin page builder for building pages of your theme. So, you can create the pages of your website using the drag and drop options. The theme has in-built Soliloquy slider. Pena has theme options through which you can change the settings of the theme. It has many options for customization like, you can change the colors using the color picker. Color of different page elements can be changed this way. The theme also has options for header and slider. You can have an image or video to show as a slider. The theme support e-commerce using the WooCommerce plugin. It is also compatible with the WPML plugin for multi-language translation. Compatible with : WooCommerce, WPML, Give, Events Calendar. NativeChurch is a Multipurpose WordPress theme specially designed for church, charity, religions, and fundraisers. The theme is well responsive and comes with multiple page layouts. The theme is well supported with Event Manager, Sermons, and Causes & Donations plugins. It is fast and easy to install with one click demo feature. Native church comes with unlimited sidebar options, mega menu, event calendar, Google fonts, slider styles and compatible with WooCommerce, Contact Form 7 and MailChimp integrated. It is well optimized with SEO and well documented. 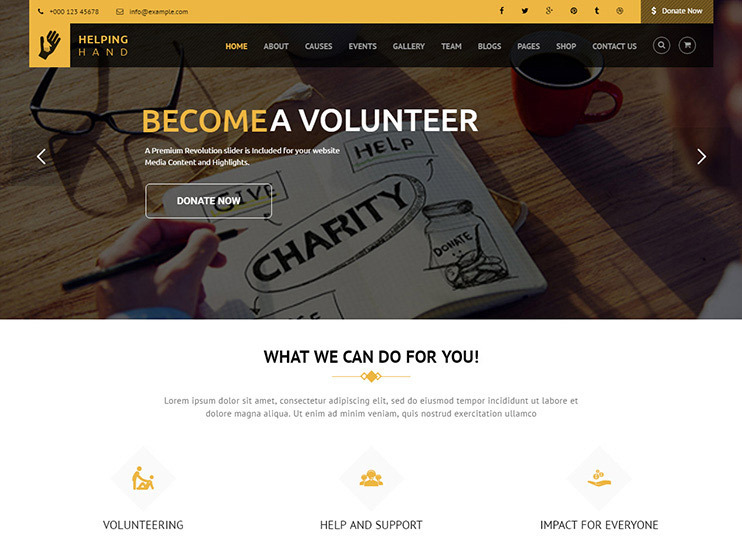 Kunco is a multipurpose and fundraising WordPress theme especially designed for NGOs, charity, donation, church and fundraising organizations. It is clean and minimal in design. The theme is easy to use and can be easily be imported with the one-click demo install feature. It is well supported with premium plugins like Visual Composer, Give Donation and Revolution Slider plugin. 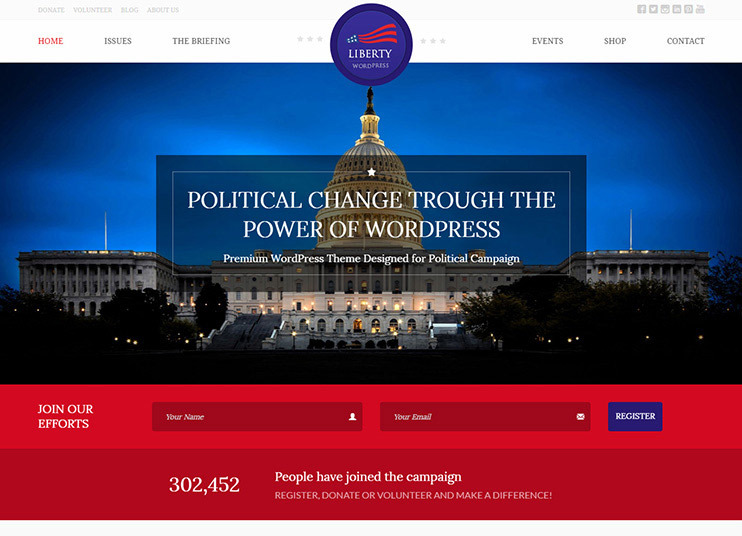 Liberty is a political WordPress theme. It lets you create an online political campaigning website. Liberty allows you to accept donations with its inbuilt features. Moreover, you can also send messages to the donors thanking them. And yes, these messages are customizable. With the theme, you can easily create and manage events and also show them on the Events Calendar. You can also make your supporters and donors subscribe to your newsletter. This way you can keep them informed about the ongoing work, your ideas and plans. Liberty is compatible with the WordPress SEO plugin by Yoast to let you create SEO friendly content. The theme is translation ready. You can create a website in your own language using the theme. For e-commerce facilities on your website, you can use the WooCommerce plugin. The name says it all - This theme is designed for creating a government portal. It is one of the best nonprofit WordPress themes, that is for local government website, or departmental websites for the government or municipal corporation. 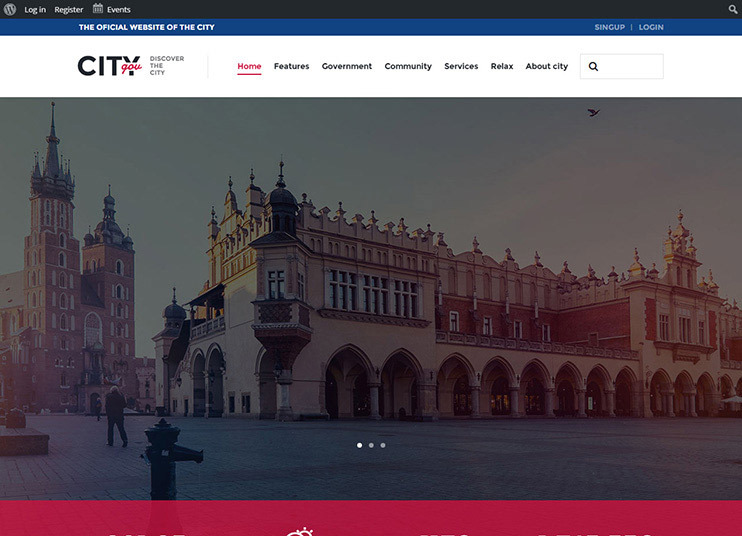 CityGov has a responsive and retina ready interface. It has many beautiful hover animations. The powerful theme options panel allows managing the theme very easily. With the number of shortcodes, the website can be further customized. You can also choose from the given custom widgets. The theme has the Donation Plugin from ThemeRex included to let you raise funds. To create the pages, it has integrated Visual Composer. So, building pages is a matter of drag and drop. CityGov is performance optimized. With the PO composer, it is possible to translate the theme into your local language. CityGov is compatible with the WPML plugin. If the targeted audience comes from different linguistic groups, you can serve them with a website that has language options. The people can choose and translate the website in their own language. CityGov is SEO ready. To include the e-commerce features in the theme, you can use the WooCommerce plugin. 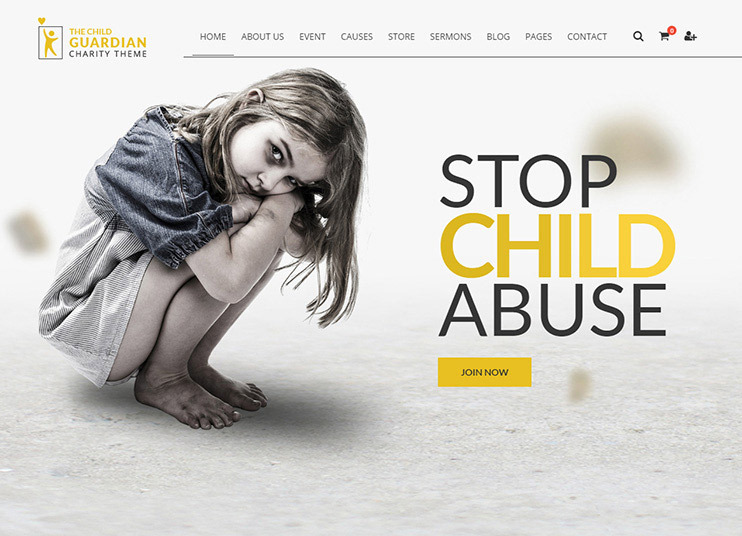 The Child guardian is a clean and modern WordPress nonprofit charity theme. The theme has three different demo versions. You can choose one and install the sample data to set a starting point for your site in 2018. Child guardian is not just beautifully designed but also feature packed. The theme comes with advanced theme options, to let you customize it. Being compatible with Visual Composer, the Child guardian allows you to create pages with drag and drop options. There are all options to change the look and appearance of the theme. You can change the colors, background, fonts, and icons of the theme as per your branding requirement. You can create and manage causes with the theme, and accept donations or charity with PayPal or credit card. If you want to create a website that sells products online, you can integrate the WooCommerce plugin. The Child guardian comes with a child theme. So, for advanced customization, you can use this child theme. Child guardian is translation ready and allows you to create a website in any language. The theme is also WPML ready allowing multilanguage translation. 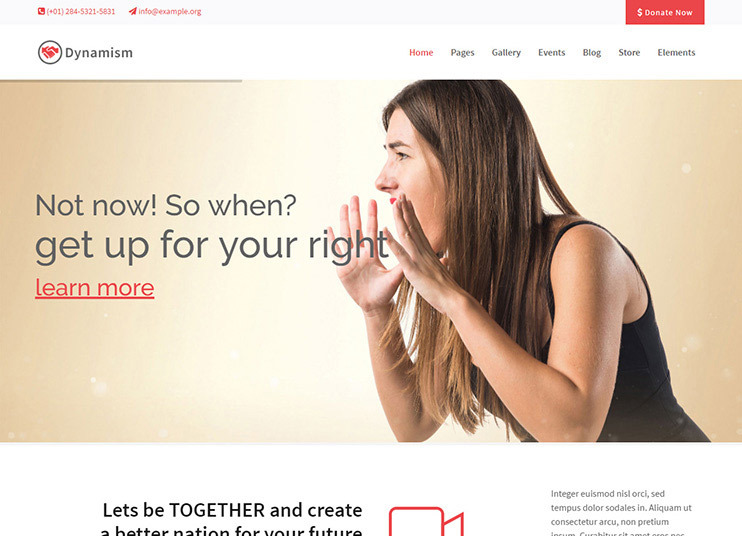 Denorious is a nonprofit and political multipurpose WordPress theme specially designed for charity, nonprofit, elections, religion, lawyer donation and fundraising campaign with amazing features and design. The theme is clean and easy to use and customizable. It provides various color variations and page builder shortcode options to create a beautiful and creative website. Denorious comes with built-in Event Calendar, Mega Menu and various styles of events and gallery which you can use. With various homepage layouts, powerful admin control panel and responsive design the theme can be created on minutes. Benefactor is a nonprofit multipurpose WordPress theme which can be used to create websites like church, NGOs and other non-profit organizations. The theme is cleanly coded and easy to use with well optimized with SEO. The theme is included with Visual Composer, Revolution slider, WooCommerce and many elite features like Causes Manager, Prayer Manager, and powerful admin panel options. Benefactor includes many additional features which you can customize your site using unlimited color customization, Google fonts, sidebars, adding video, image gallery, shortcodes includes and many more. It includes different header and page layouts which you can use to create a well responsive and attractive nonprofit WordPress website. Charity comes with options for multiple homepages. The theme is basically a nonprofit WordPress theme, that can be used for multiple purposes. To build pages by dragging and dropping page elements, you can use the integrated Visual composer plugin. The powerful admin panel of the theme. The theme has options for portfolios. So, you can explain your cause using the portfolio pages. You can create causes on your website. The donors can donate for a specific cause using the integrated PayPal. For easy search facilities for the visitors, the theme has Ajax search. Moreover, there are many customization facilities in the theme. To create e-commerce facilities in your theme, you can use the famous WooCommerce plugin. The theme can be translated into any language. With the WooCommerce plugin, it is possible to change the theme to a multi-language website. HelpMe is nonprofit WordPress themes. You can choose from the 16 pre-made demos. For supporting the monetary transaction in the site, the theme has inbuilt PayPal, Stripe, and Authorize.net gateways. The theme allows you to choose the page layouts and the pre-built header and footer styles. For theme customization, you can choose from unlimited colors, icons, fonts, and styles. HelpMe also supports the mega menu. To create pages, you have the Visual Composer tool and more than 100 page elements. 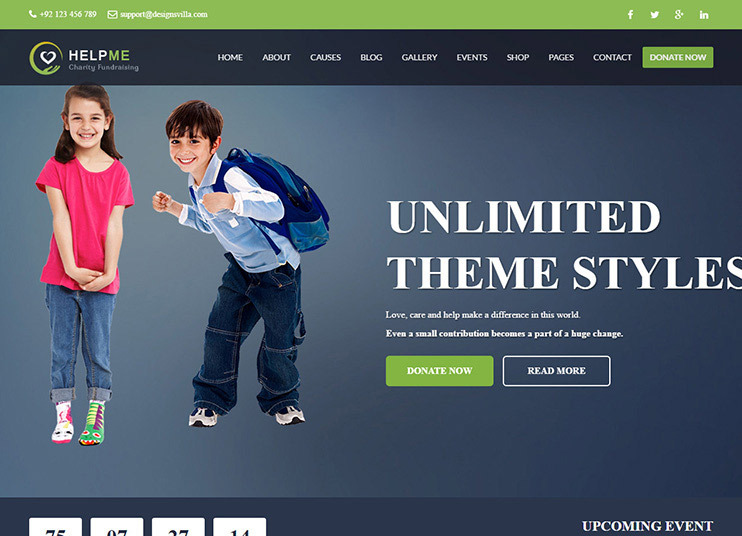 For advanced customization, the theme supports child theme. HelpMe is compatible with WPML for multi-language translations. With WPML, you can create a website that can be viewed in different languages. The theme can also be used to create a website in RTL language. For the selling and e-commerce related facilities, the theme has compatibility with the WooCommerce plugin. HelpMe is SEO optimized. 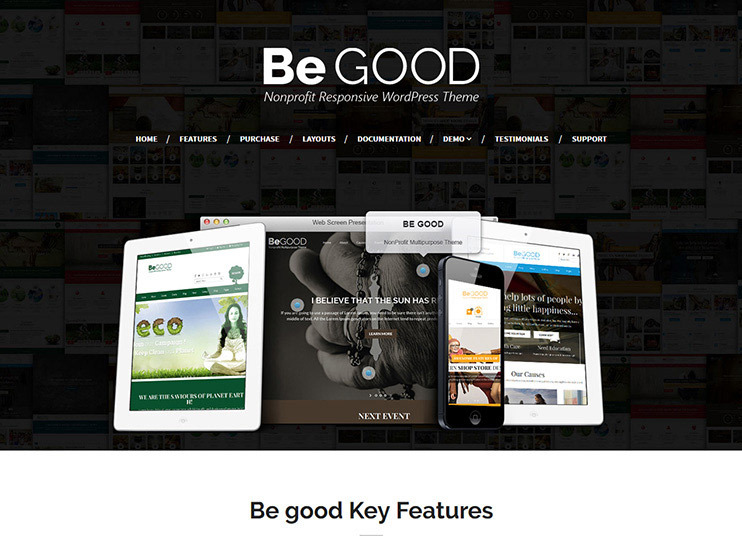 Be Good has 7 different homepage layouts. You can go for the one that best suits your purpose. You can choose from the available header and footer options. Each demo of Be Good is created with a unique concept. There can be many more concepts yet. So the theme is a multi-purpose nonprofit theme with varied functionality. The theme includes event management and service management systems. Be Good is seamlessly compatible with the WooCommerce so that you can sell and raise fund using the website. The theme has many customization options. You can change the icons, fonts colors and the background of the theme. The code of the theme is clean and understandable. So, in case you want to add functionality to the theme, you can tweak the code easily. The theme is translation ready and is compatible a WPML plugin for multi-language translation. Generosity is a charity donation website theme. It is a non-profit WordPress theme that has all the required features for your charity website in 2018. The theme has powerful admin options to activate and manage the features. Moreover, there are multiple options for changing the look of the theme. You can change the colors of the theme with the help of the customization options available at the back-end. It supports Visual composer to allow drag and drops page building for your site. With Generosity, you can create posts with varied features. The posts can have image sliders, audio players, and stylish tags. 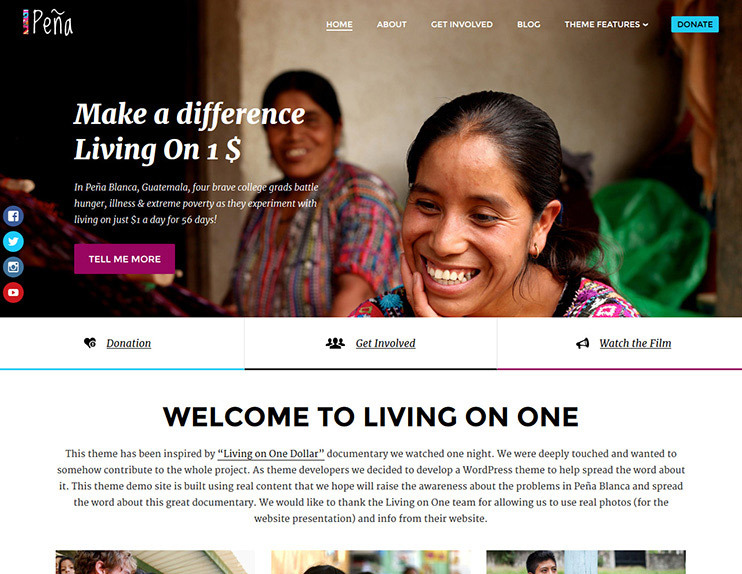 Being a charity foundation fundraising WordPress theme, it can accept donations using PayPal. It is also enabled for recurring donations. Moreover, there are custom widgets and shortcodes, that you can use for your site. Generosity has support for posting events on the website. Generosity supports single language as well as multi-language translation. The theme is SEO optimized. It has a clean code that is easy to understand and edit to extend or change functionality. 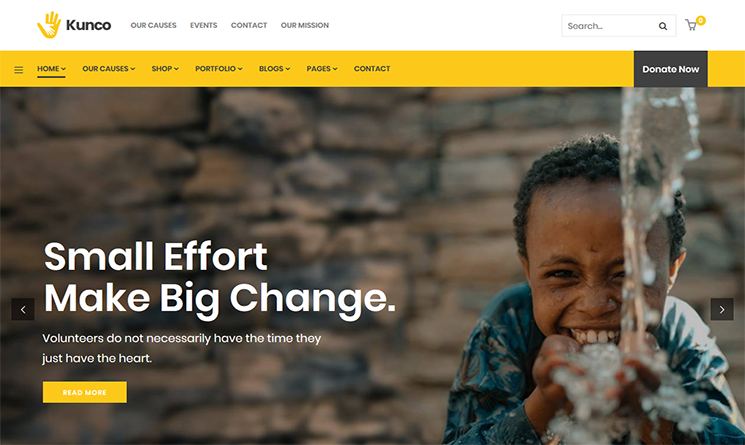 Charity Hope is a modern, clean and minimal design nonprofit and fundraising WordPress theme. 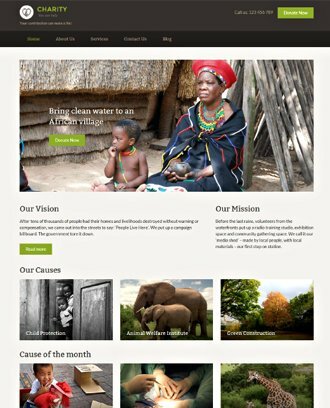 The theme is easy to use and customizable and includes various header/footer styles and page layouts to create attractive NGO websites. The theme is well supported with Give plugin, Visual composer, Slider Revolution, Event Manager plugin and many more. 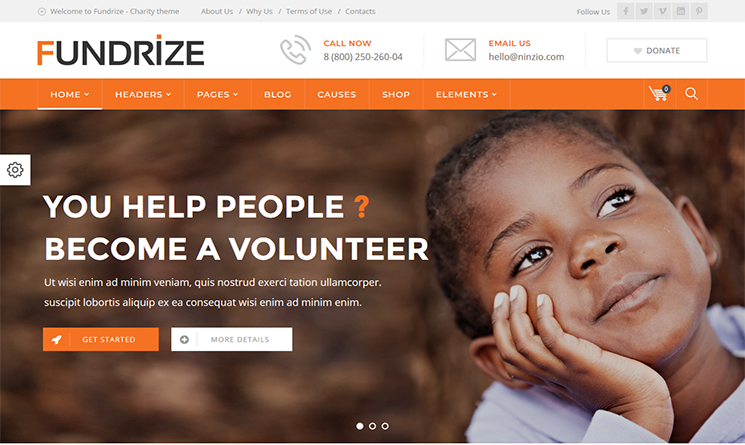 Charity Hope theme is responsive and includes multiple homepage variations. It comes with free google icons and fonts, Mailchimp integrated and contact form 7 plugin included. It is well optimized and SEO friendly and well documented. 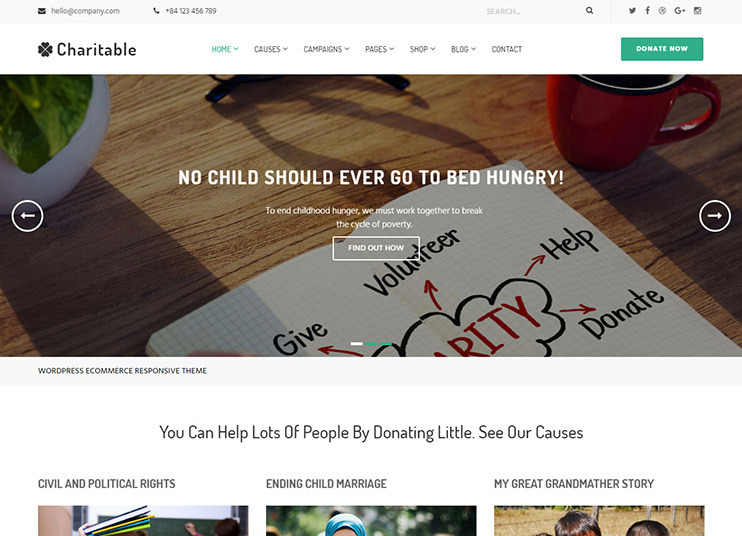 Samphatic is one of the best nonprofit WordPress themes for creating a website for your NGO. It comes with an inbuilt page builder called the Samphatic page builder. Using it, you can create or your pages with drag and drop options. The theme allows you to manage the appearance of each and every page of the theme separately. It is designed to perform well on any device. There are unlimited options to change the theme's appearance. Change the background and color with easy options. Also, use the FontAwesome vector icons and more than 500 google fonts for your website. The Samphatic theme has multiple pages and amazing Parallax effects. With all the extensive features, it will let you set up a full-fledged nonprofit charity website. 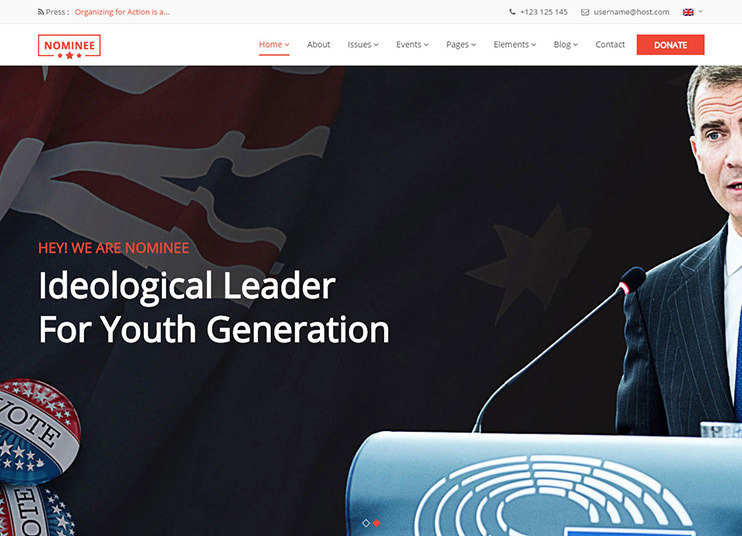 Dynamism is a good-looking and modern WordPress political theme. It is suitable to create a website for the nonprofit organization, charity, fundraising, Activity or Political website. With Dynamism, you have 6 homepage styles to choose from. If you want to create a comprehensive one-page module in your site, you have 3 one page styles available. The included essential grid will let you create content grids by drag and drop options. The Advanced admin panel of the theme makes it possible to change the theme settings with easy options. With Dynamism, you have the options to create and manage causes. You can accept payments on your website using the PayPal plugin. The theme is translation ready. To create a website in multiple languages, the theme supports WPML. It also supports RTL mode to create websites of Right to left orientation. Alone is a charity donations website theme. If you want to sell stuff for raising funds, WooCommerce can be integrated and e-commerce features can be included into the theme. The theme makes it possible to collect donation using Ajax forms. Visual Composer is built-in the theme, so you can create pages using the drag and drop options. The theme has sections for parallax background sections. The theme has 3 header options to let you choose from. Alone allows you to create and manage events. It also comes with custom CSS editor so that you won't have to find and change the CSS file. Alone can be translated into the desired language. It can also be used to create a multilingual website, using the WPML website. The code is SEO optimized. 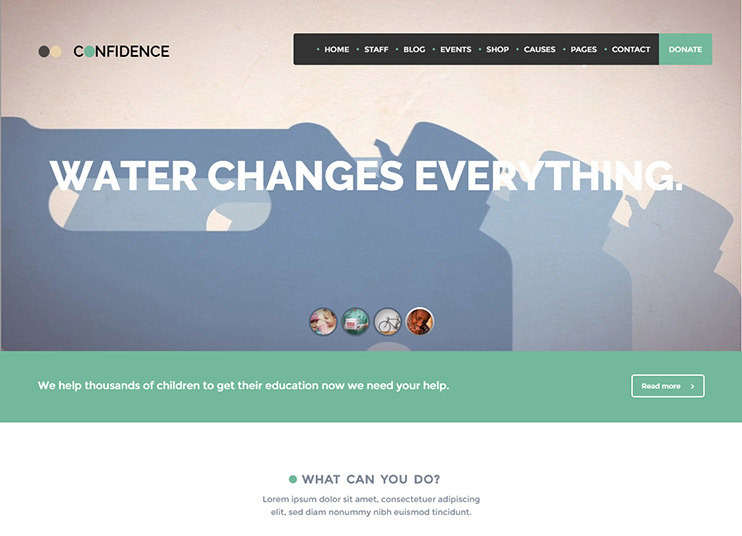 Confidence is a NGO and Charity WordPress theme. It has the features to create a charity, church, NGO or any other nonprofit website in 2018. This theme comes with causes management facility. So you can create and manage the causes on your website. The theme also has the event management options. So, you can display the events on Events calendar. With the Visual Composer, you can create and manage pages using drag and drop options. For beautiful sliders in the website, Revolution slider, is included in the theme. It has unlimited customization options, you can choose from. The code of the theme is clean and easy to modify, so you can customize it very easily. Confidence can be used to create a website in any language. The theme can be used to create a multilingual website. To include the e-commerce facilities on the website, you can use the Woo-Commerce plugin. Confidence is SEO optimized for great Search ranking. 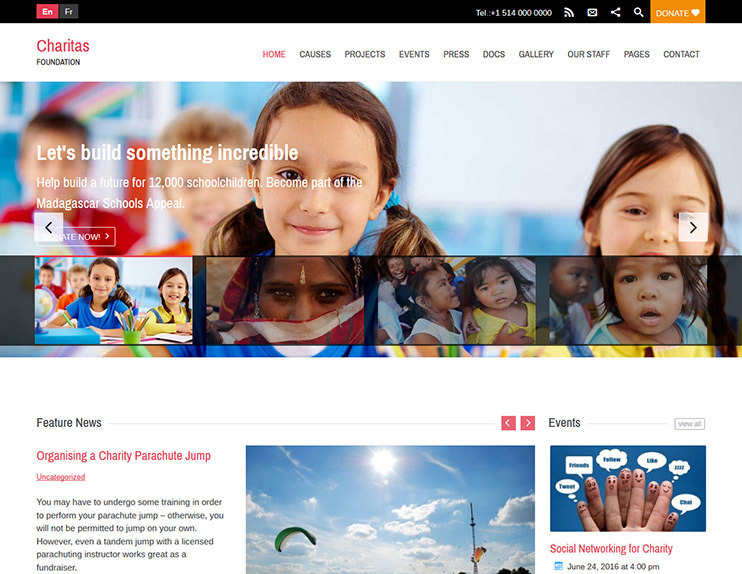 InCharity is a non-profit WordPress theme for creating websites for charity and raising funds on causes. It comes with 6 homepage layouts. You can select the one that you like. With the Visual composer page builder, you can create and manage the pages of your site very easily. There are very powerful theme options available at the back-end. So, you can choose the colors, headers, layouts, and fonts. With the InCharity theme, you are allowed to add any number of campaigns. For this campaigns, you can receive funds and donations using PayPal that comes integrated with it. The theme is coded with strict SEO standards. InCharity is compatible with the WPML plugin for creating a multi-language ready website. It is also compatible with WooCommerce for e-commerce related features. 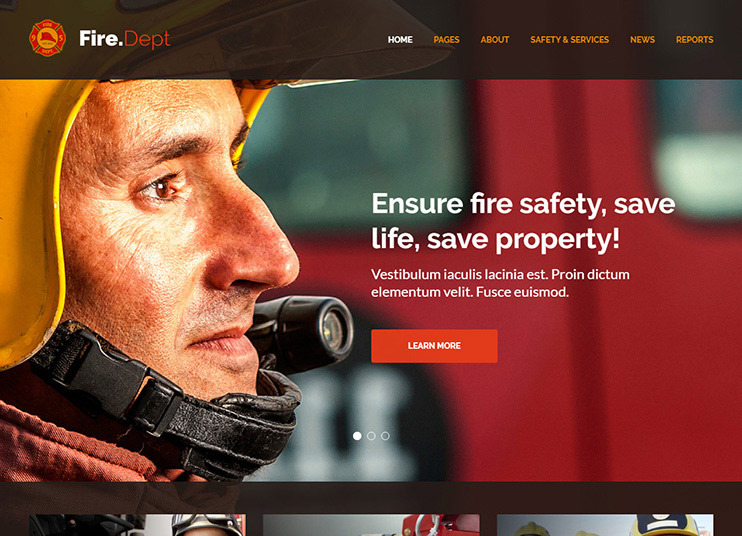 Fire Department, Fire Station and Security WP Theme is one of the best nonprofit WordPress themes. As the name suggests, the theme is specially designed for use by the fire safety department for creating their online mark. But, it can also be used for multiple other purposes. If you want to create a website for a fire safety department, display your brave fire-fighters, your fire station services, the hard-working team of firemen, or rescue team, you've just found the best option. The theme is designed to suit its purpose. This theme has multiple options for customizing theme. You can choose the color, fonts, background, etc. It is a responsive theme and has been optimized for use in mobile phones. You have choices for homepage layouts. In order to get your website noticed by the search engines, the theme is SEO ready. It comes with PO composer so that you can translate the theme and create a website in your own language. This will improve the user experience as the local people can now get the information in their own language. The theme is compatible with WPML so you can also create a website that supports multiple languages. Nominee is a political WordPress theme. Nominee has it all that's required for a political campaigning website. With this theme, you can create a website that displays the nominee and other political representational details. For ease of composing the web pages, the theme comes with the Visual Composer. So now, everything on the page can be managed by drag and drop. Besides, for the theme customization, there are a number of theme options. You can configure everything about the theme with these options. Nominee also offers a number of shortcodes to use for the theme. This theme, lets you show the details of a nominee of a political party with a candidate profile page. It also has the capability to show the events. You can also display the campaigns of the political party using this themes. With Nominee, you can create a website that can be translated into multiple languages. The theme has all the features needed to promote or introduce a candidate or political person. 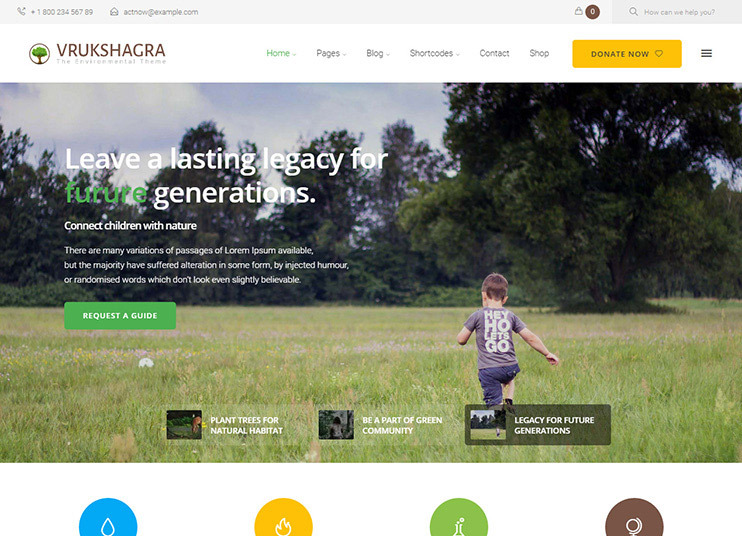 Vrukshagra is an environmental and nonprofit WordPress theme. It can be used to create a website that sends the message of "save the nature" to the world. Vrukshagra comes with lots of customization options. There are many ways you can change how the theme looks and works. The theme has a very beautiful design and the page elements have simple but elegant animations. The theme comes with an inbuilt donation page for accepting the donations. It also has custom page templates and custom widgets to be used in the website. To create pages, you can use the Visual Composer. It will let you create pages using drag and drop options. Vrukshagra comes with child theme included. So, if you wish to make extreme customization and code changes, you can do it using the child theme template. Charitable is a theme for crowd funding and charity. So, you can create a website for NGO, non-profit organizations, donations, church, and fundraising website. You can select from the 3 available header styles. You can also select from the available demo styles. For accepting payments, the theme has integrated donation page design and PayPal. There's also a special post type for causes. You can add, manage and display the causes. If you want to sell things for raising funds, you can do that too. Integrate the WooCommerce plugin and make your site ecommerce ready. The theme is SEO ready. Charitable is translation ready. You can create a website in your own language. The theme can also be used to create a website that translates itself into multiple languages. It also comes with a child theme pre-included. 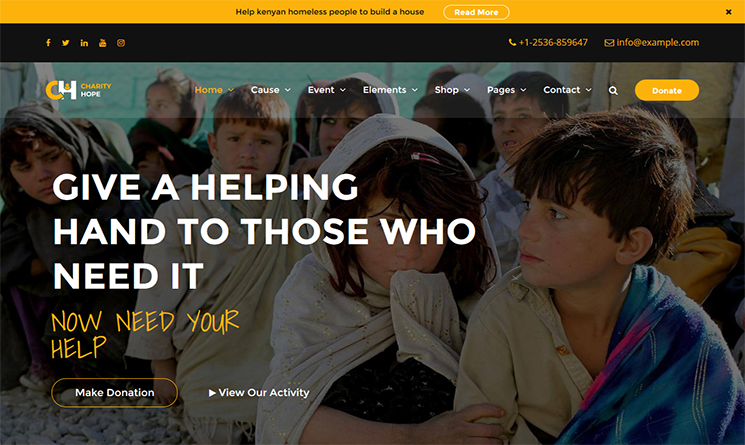 Helping Hand is a charity or Fundraising WordPress theme. The Helping hand can be used to create a website for NGO, nonprofit organizations, church, and donation and charity. Helping hand comes with the Visual Composer page builder. So, you can create pages with drag and drop options. With this theme, you can create causes and get donations for it. Besides you can use the site to display sermons and events on the website. It also has a news ticker feature. The advanced themes options will allow you to create changes into the theme files. These options are easy to use and intuitive. There are many available widgets and shortcodes with the theme. The WooCommerce makes it possible for including eCommerce facilities into your website. The theme is SEO optimized. It also comes with the child theme template, so you can make advanced customization in the theme using it. 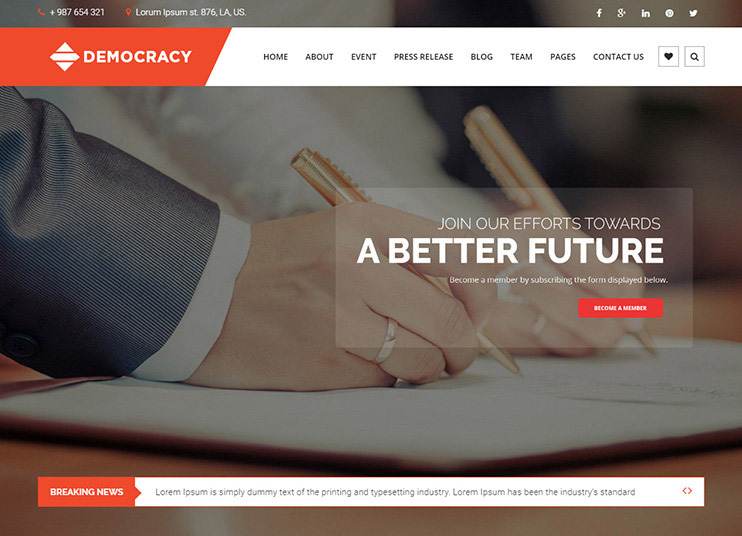 Democracy political is one of the best nonprofit WordPress themes for the political website. Such a website can be one that introduces a political party or a candidate. It is responsive and retina ready. The theme has 3 demo versions : Political, Democracy and lawyer. It includes 5 different sliders. It comes with an Xpress drag and drop page builder. So changing the layout of your web-pages is very easy. You can choose and manage the header and sidebar styles. With this theme, display your events, let your users book tickets, and display the candidate's profile. It also has features using which you can introduce your political team to the people. The theme has options are vast and intuitive. Using the theme options, you can make the desired changes in the theme. You can also change the theme appearance by changing colors, fonts and using the widgets and shortcodes. It also allows choosing from the available blog and portfolio layouts. The theme has a clean and SEO friendly code. Democracy is translation ready and supports WPML too. Attiya is a fundraising theme for nonprofit organizations. It has a responsive and attractive design. Attiya is compatible with the Visual Composer. With the Visual Composer plugin, you can create web-pages using the drag and drop options. The theme has an inbuilt option for donating. The theme also has options for recurring payments. Attiya has the option for creating and managing events. You can also show the events on the Events Calendar. It also has the option for MailChimp newsletter. The theme is compatible with the Give plugin for fundraising. There are many theme options and a comprehensive admin panel for customizing the theme. The code of the theme is clean, so for advanced customization, you can tweak it too. Attiya is compatible with WooCommerce for selling products online. It comes with the .po and .mo files to create a website in the desired language. It also allows creating a website that translates itself into multiple languages. For this, you can use the WPML plugin. The theme also has the option to add causes and projects. You can also use the theme for creating a website in RTL language. Sports Club is a WordPress theme for Sports Club, news, team, and equipment store. 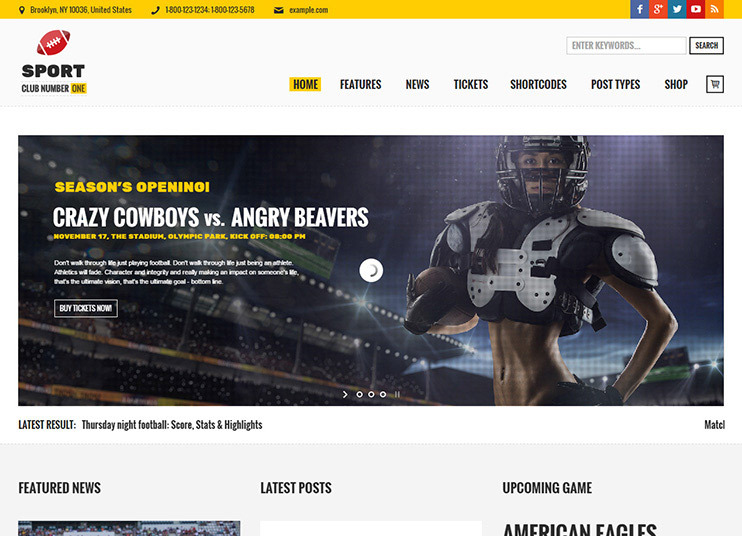 The theme is suitable for any kind of sports related website. It is highly customizable and easy to use. Sports club can be used as a sports news website. The theme has a facility for posting news and events. You can display the events using the Events Calendar or the Events Calendar Pro plugin. The theme is compatible with the popular and efficient eCommerce plugin, WooCommerce. So, you can even sell the event's tickets using WooCommerce. With WooCommerce, the theme can be used to create an online sports equipment shop too. You can also change the fonts and colors of the theme. Moreover, there are many shortcodes and custom widgets. If you wish to create a website for a local sports channel in your native language, the theme supports translation. For a big website that is used by people speaking different languages, you can use the WPML plugin and create a website into multiple languages. 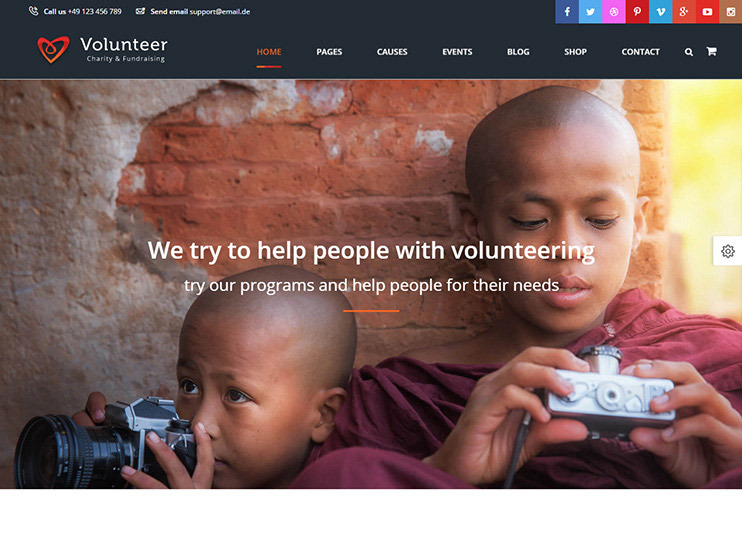 Volunteer is a charity foundation fundraising WordPress theme. 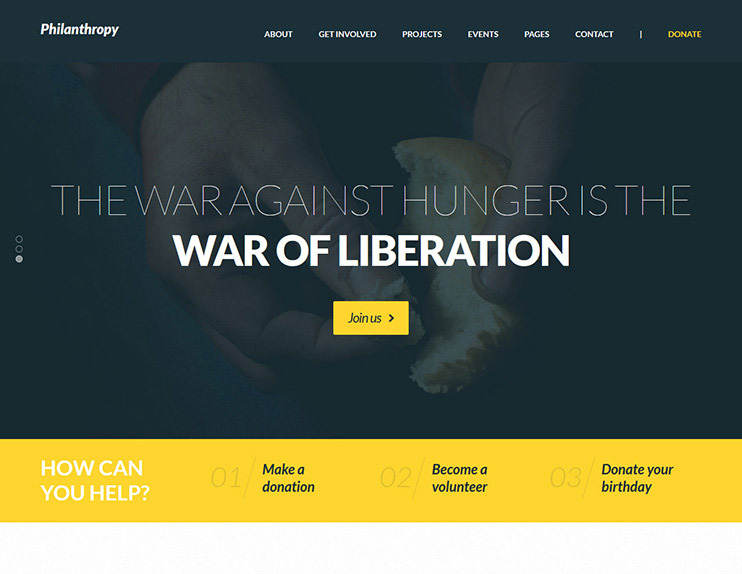 You can use this theme for your NGO and fundraising non-profit organizations' website. With the Visual Composer page builder, you can create and manage the page layouts with drag and drop options. The theme also has smooth transition effects on its page elements. To accept the donations and charity with your website, you can use the charitable plugin. You can also show Donation count in your website. Volunteer has a very attractive design with smooth element transitions and animations. The theme also has beautiful parallax backgrounds. 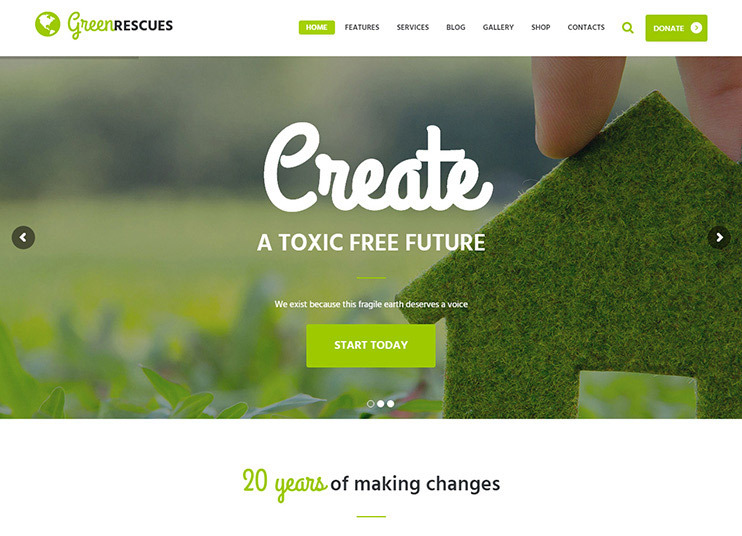 Green Rescue is a beautifully named and designed theme for the Environmental protection groups. The theme can be used to create a website to spread the message of saving the environment, animals, and nature. Green Rescue comes with 3 pre-made page layouts. The theme also comes with the Visual composer integrated. It allows creating pages using drag and drop options. It also comes with a media content manager. The theme options will allow making changes in the theme settings very easily. There are multiple custom widgets and shortcodes for different purposes. The theme is SEO friendly and comes with .po and .mo files. The theme is compatible with the WPML plugin. So, create a website into multiple languages using the theme. 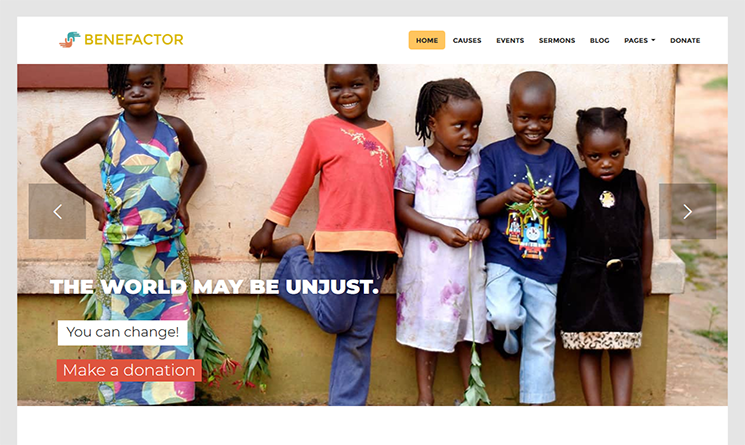 Angel is a nonprofit WordPress theme for creating a website for your NGO, Charitable trust, and fundraising organization. It has a responsive and purpose-oriented design. The theme is retina ready. Angel comes with unlimited customization options. With easy options, you can make the theme work just the way you want. The theme has a number of shortcodes. It comes with a donation section. Using this part, the interested persons can donate on your website. So, you can use this theme to create a website that raises funds for some cause. You can also integrate the Events calendar plugin to display the events on the website. This can be helpful to let the people know about the upcoming events on your site. The theme supports Google fonts, FontAwesome icons and color options. Angel comes with integrated google maps too. The theme has optimized code that guarantees a smooth performance. The theme comes with ready to use a contact form. 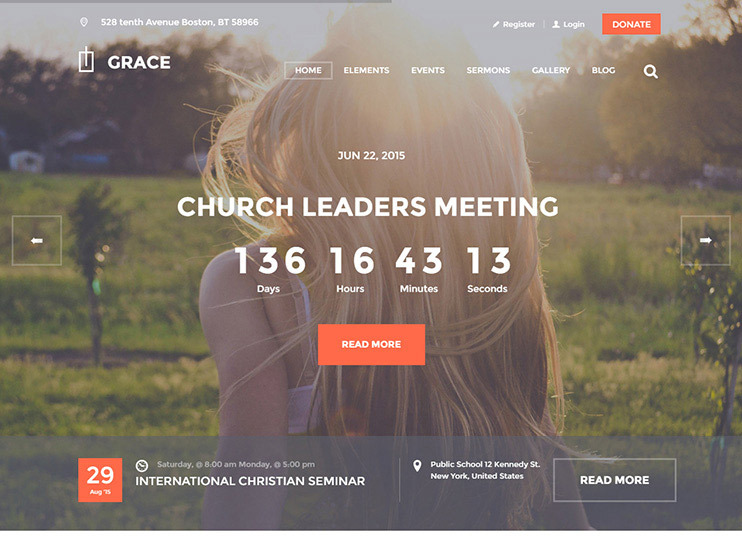 Grace is a religious and church website theme. It is one of the best nonprofit WordPress themes, for creating an attractive and comprehensive Church website. Grace has all the options, you'll need to customize the theme to let you create a religious website. There are many shortcodes and custom widgets that can be used into the theme. There's a shortcode builder too. Compatibility of Grace with Visual Composer ensures that you can create the pages with drag and drop. The theme has a very modern and responsive design. Moreover, the theme is coded with strict SEO practices. For the visitors to search easily through the site, the theme has the Ajax search functionality. With the PO composer, you can generate the localization files needed to convert the website into another language. With compatibility for WordPress, the theme can be used to create a website in multiple languages. 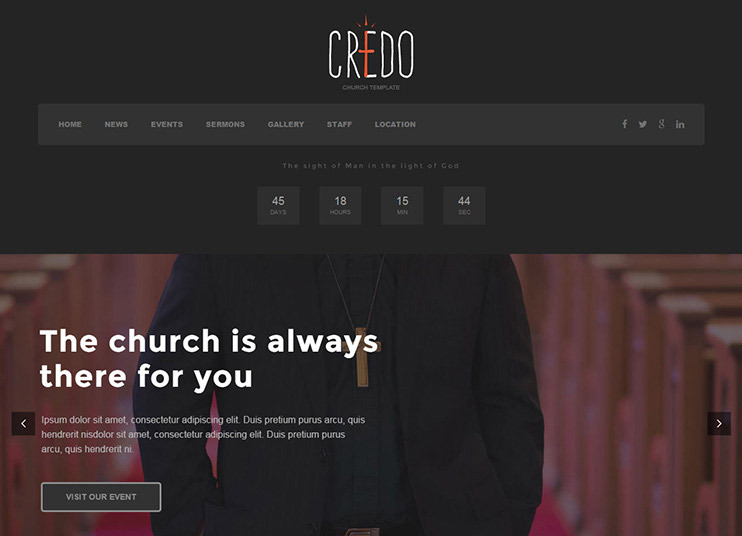 Credo is a nonprofit WordPress theme for the church. 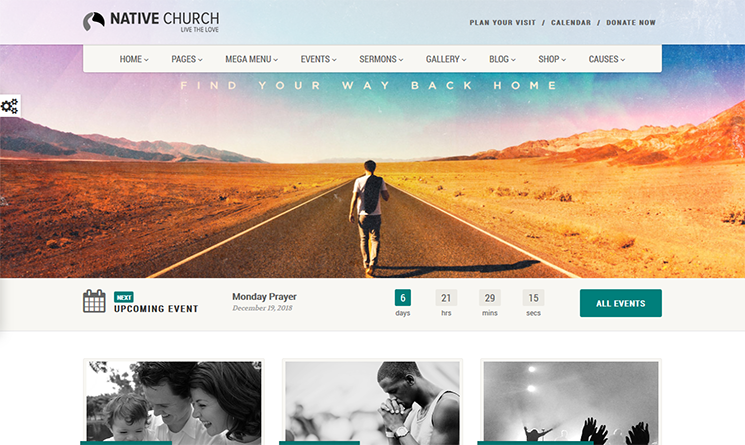 The theme has it all to let you create an awesome church website. 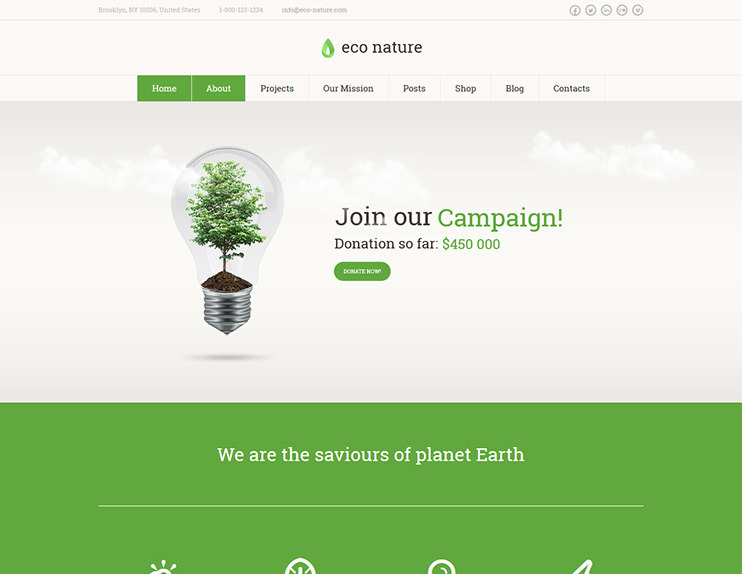 You can also create a website for NGO or fundraising campaign using the theme. Credo lets you create and manage sermons. You can create a sermons archive in your website. You can have them in video, audio or image format. The theme has the facility to show the church events. So, the people can know about the future events of the church. There's also the facility to display the countdown for the event. With Credo, you can also display the gallery. The gallery can contain photos as well as videos. With the revolution slider, the theme is given an attractive touch. There's also a feature to accept donations with the theme. You can also display the staff details with the theme. It can also be used for multiple locations for church. Credo is translation ready and also compatible with WPML. So, you can create a website into any language using credo. It is coded with SEO in mind. Credo is performance optimized and for advanced customization, you can include the child theme too. 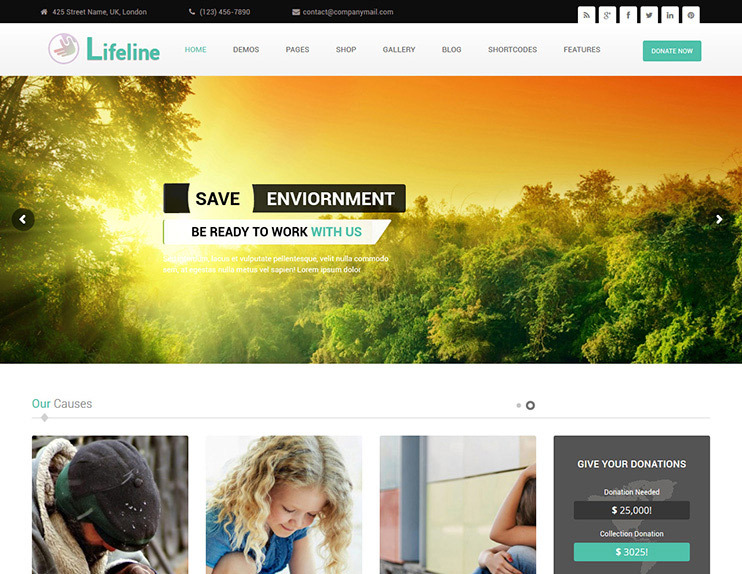 Lifeline is a beautiful and responsive and one of the best nonprofit WordPress theme. It has unlimited opportunities with which you can create a nonprofit website of any kind. 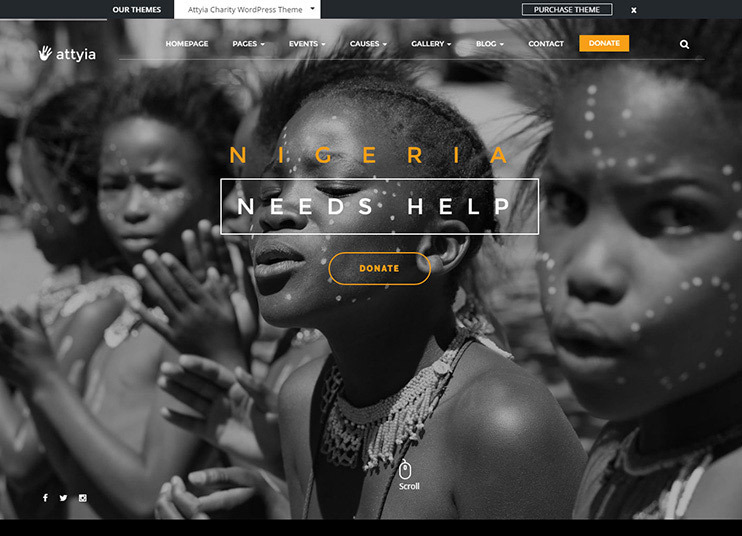 You can use this theme for creating a website for charity, fund-raising, church, religious group, environment, etc. The theme has 13 modern homepage designs to choose from. The theme has an inbuilt system for receiving donations and fund-raising. You can accept these payments through PayPal. With this theme, you can also raise funds by selling commodities. The theme has the page builder with more than 85-page building tools. All these tools can be used to create pages easily and quickly. With the blog facility, you can spread your message and ideas. The theme has 5 header patterns to choose from. You can also select from the 10+ predefined color schemes. It supports sticky menu. The advanced admin options can be used to customize the theme with easy and intuitive options. The theme supports translation. You can create a website in multiple languages using the theme. It also has an RTL mode for creating the website in Arabic, Hebrew or any other RTL language. It is SEO optimized. 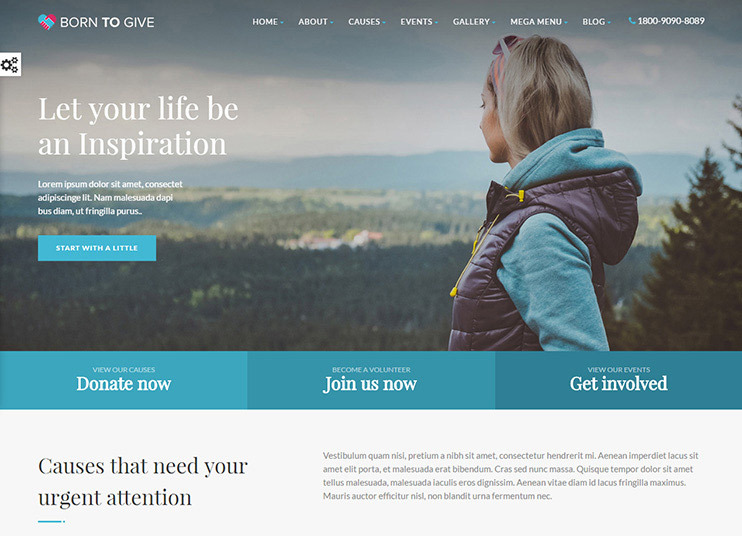 Philanthropy is a best nonprofit WordPress theme for creating websites for the church, and nonprofit organizations. It has options to change the look of the theme according to your desire. The theme supports the Give plugin for accepting payments and raising funds. There are innumerable colors and font options for your website available with the theme. The Events Calendar will allow to display events on the site. There are numerous page layouts. Moreover, the visual page builder will allow to change the page layouts or create a new page layout using drag and drop options. Philanthropy is built on the Unyson framework. It has many options to change the theme by offering lots of customization options. The theme is SEO friendly. The theme is translation ready and multi-language translation. It is WPML compatible. It also comes with the option for automatic backup. The theme is translation ready. It can also be converted into multiple languages using the WPML plugin. The theme also has custom post types to accommodate your posts. Charitas is speed optimized. One of the best features of Charitas is that it shows automatic progress bar for the causes once after payment is done. So, add your causes, create your events and let the people know about it. Also, accept the donations with the inbuilt PayPal. The theme has many customization options. The advanced admin panel lets you make all the desired changes in your site. You can choose from the unlimited color options. You can also choose the widgets and also set the slider. Church suite is a responsive and attractively designed WordPress theme for creating nonprofit websites. You can use the theme to create a website for fundraising, charity, church, religious organizations and NGOs. Church is fully packed with features and options to make an amazing nonprofit website. There are numerous homepage layouts to choose from. It also includes a one page template for creating a one page website. So, you can choose from abundantly available designs for your site. Church Suite has the feature to create and display the events on your website. The fully-featured events management options will let you organize events, make a booking, manage users, etc. To make it more interesting, the theme also has an option for displaying events countdown. With Church suite, you can create and manage sermons in form of videos, audios, and even pdf downloadable form. To raise funds and donations, the theme has the inbuilt feature to create and manage causes. You can also accept donation using the theme. Besides, there are multiple options to change the layouts using the page builder. 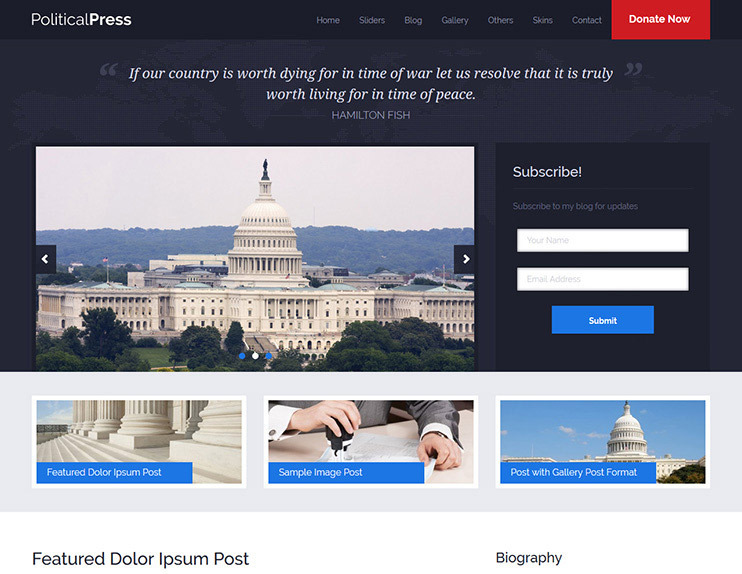 Political press is a premium WordPress political theme for creating nonprofit websites. It can also be used as a blog or political news website. You can choose from the available skin options and header style. The theme also has gallery layout options to choose from. The homepage of the theme can be re-arranged using the theme options. The theme is compatible with the Events calendar plugin. So it is possible to show the events on a calendar. PoliticalPress comes with the .po and .mo files. You can translate the theme into the desired language using these files. Compatibility with WPML makes it possible to convert Political Press into multiple languages. The theme comes with shortcodes and custom widgets. For good SEO score, the theme files are SEO optimized. It comes with a child theme template included. So, to extend the theme features, you can use it. Donation is a fundraising premium WordPress theme. The theme can be used to create a website for charitable trusts, donation, fundraising organizations or a church website. It comes with a number of shortcodes and widgets that you can use for your website. With the powerful admin panel, you can manage how the theme looks and behaves. For accepting donations, it supports the donate plugin. You can also use the theme to create and manage events. To display the images, there's a facility of the gallery too. The donation theme comes with SEO optimized theme files to ensure that the site gets noticed by the search engine. You can translate the theme into the desired language using the available localization files. The theme can also be translated into multiple languages using the WPML plugin. Peak is a highly customizable and fundraising theme for nonprofit organizations. It is responsive and has plenty of options to customize the appearance and behavior of the theme. The theme supports SiteOrigin page builder. So, page building with the theme is a matter of drag and drop. To create and manage the events the theme supports the popular Events Calendar plugin. The events venue can be displayed using the google maps. There a custom post type to let you create and manage the campaigns. With these campaigns, the theme allows to collect donations with the help of giving plugin. For accepting the donations Paypal is integrated whereas there are numerous other payment gateways options too. If you want to sell goods to raise funds, you can do so using the WooCommerce plugin. With inbuilt options, you will be able to track and manage donations. The theme also keeps a list of the donors. There's also a feature to export the donation data. Peak is translation ready and SEO optimized. 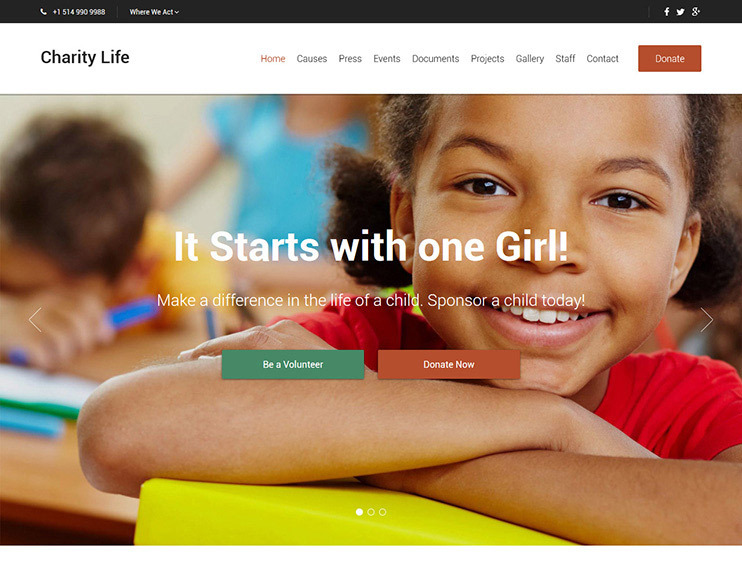 Charity Life from WPLook studio is one of the best nonprofit WordPress themes. It is a fundraising theme for nonprofit organizations. You have unlimited theme options with Charity Life, you can make the theme work just like you want. The options are easy to manage and very intuitive. It comes with custom post types to suit the purpose. There are a number of custom widgets that you can use for your site. Charity life has donation facility included. It comes with PayPal integrated to accept donations. The theme is SEO and speed optimized. Charity Life comes with child theme included. So, you can directly use it for advanced customizations. It is translation and multi-language ready. 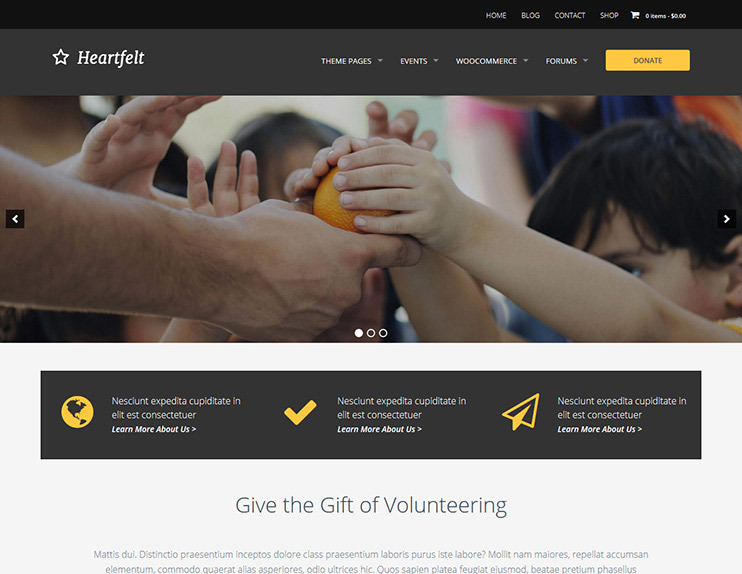 Heartfelt is a nonprofit WordPress theme. 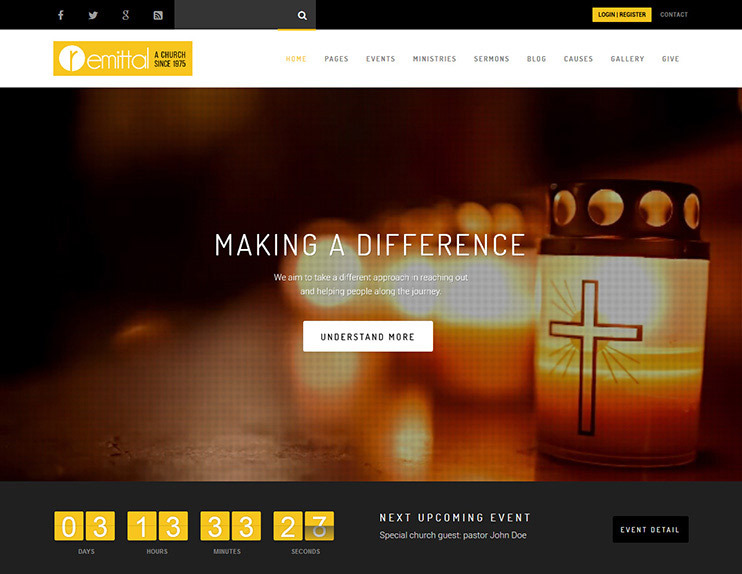 The theme can be used to create a website for an NGOs, charity, donations and fundraising organizations, or a church. You can create events in the theme using the Events calendar plugin. The theme will also let you show the events to the visitors on the Events calendar. Heartfelt is not just responsive but optimized for the use in mobile phones. To start forums in the theme you can use the bbPress plugin. The theme has a donation pop-up feature. You can integrate the desired donation system on your website. With the powerful admin panel and theme options, you can change the theme functions and appearance. Choose from unlimited theme skins. HeartFelt can be used to create a website in any language using the .po and .mo files available. Lambda is a multi-purpose theme that can be used to create a nonprofit website for charity, donations or fundraising. Lambda supports Visual Composer page builder, So you can create pages with drag and drop options. It comes with revolution slider included for a beautifying touch to the theme. There's a live customizer that will reflect the changes you make real-time. You can try different combinations here and save the one you like. 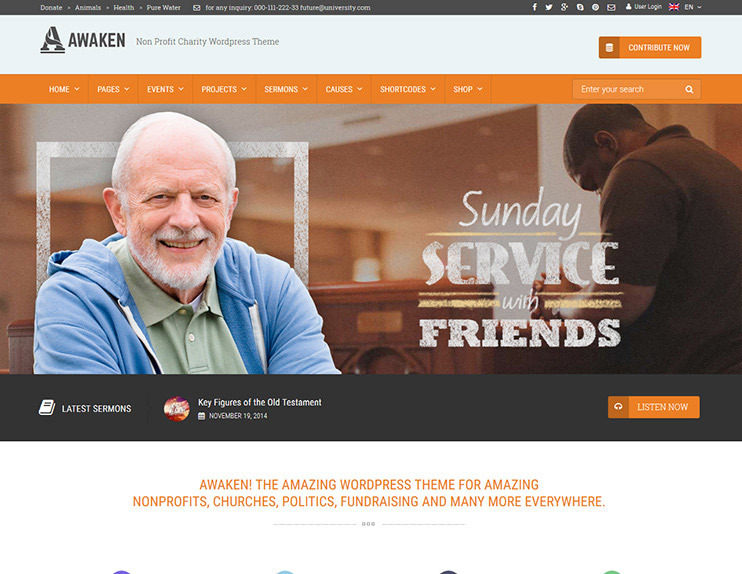 Awaken is a very simple and best nonprofit WordPress theme that can be used to create a website for NGOs, charity organizations, fundraising, and political website. You can create a nonprofit WordPress website in your own language using Awaken. Being compatible with the WPML plugin, you can also translate it into multiple languages at once. You can also earn charity by creating a shop online using the WooCommerce plugin. Heal is a charity donation websites theme. You can create a website for NGO, and fundraising websites or any nonprofit website. You can accept donations using the theme with the help of the integrated PayPal systems. The theme also allows to add and show events in the website. If you want to display the news using the theme, you can do it using the news options. If you ever wish to include additional functionality in the theme by tweaking the code, you can do that too. The code of the theme is clean and understandable. Being compatible with the WooCommerce plugin, the theme can be used to sell the commodities online and raise funds. The theme is SEO optimized. Act is a nonprofit WordPress theme that can be used for multiple purposes. You can create a website for any non-profit purpose like charity, fundraising campaigns, donations, etc. Act has an inbuilt crowdfunding system. The theme supports full events management. There are events listing pages, events detail page, and events calendar to support events. With the WooCommerce plugin, you can sell commodities with the theme, to raise funds. Act also has a donation section. This allows the visitors and site users to donate on your site. Besides, there are innumerable customization options available with the theme. The revolution slider is included to give the site a beautiful look. Eco Nature is the theme for environmental protection and preservation organizations. The inbuilt drag and drop page builder allows you to rearrange the page elements and redesign the pages. You can also create a page layout of your own using the drag and drop options. With the amazing shortcodes, you can make your content more interactive. Eco-nature supports a large range of plugins. The theme comes with portfolio and blog layouts to choose from. Eco nature is SEO optimized and also allows integration of the most popular SEO plugins. Eco nature is translation ready and allows to create the multilingual website using the WPML plugin. There are unlimited customization options for Eco nature. So, you can create a website of your own imagination very easily. 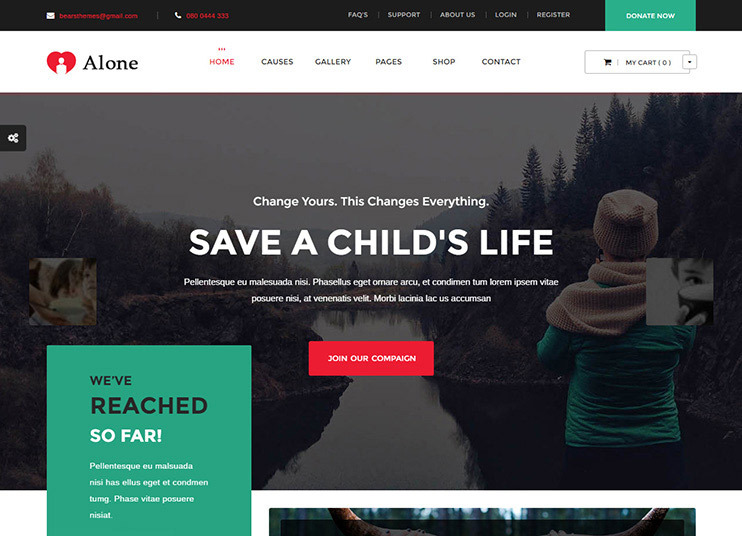 Fundrize is an ultra responsive and responsive donation & charity WordPress theme. It is clean and minimal design with lots of features which you can create an attractive donation website within minutes. It is easily customizable and requires no coding skills. The theme comes with FREE Visual Composer, Revolution Slider and Donation Plugin and comes with a powerful admin control panel. Fundrize is easy to use and comes with one click demo install feature and you can redesign your site with multiple header styles and page layouts included with this theme. It is well supported with WPML and WooCommerce plugin. The theme is well optimized and SEO friendly. This is a nice collection for the Non-profit WordPress theme. I really loved it. But is there any FREE theme available in this list? All the listed theme are paid ones in this Article. If you are looking some FREE WordPress theme, you can check this link which have Best FREE WordPress themes. Nice list of charity themes! If you need any sort of help choosing between this themes please let me know. A Huge collection of Non-Profit theme. I selected the Be GOOD theme for Charity Donation. 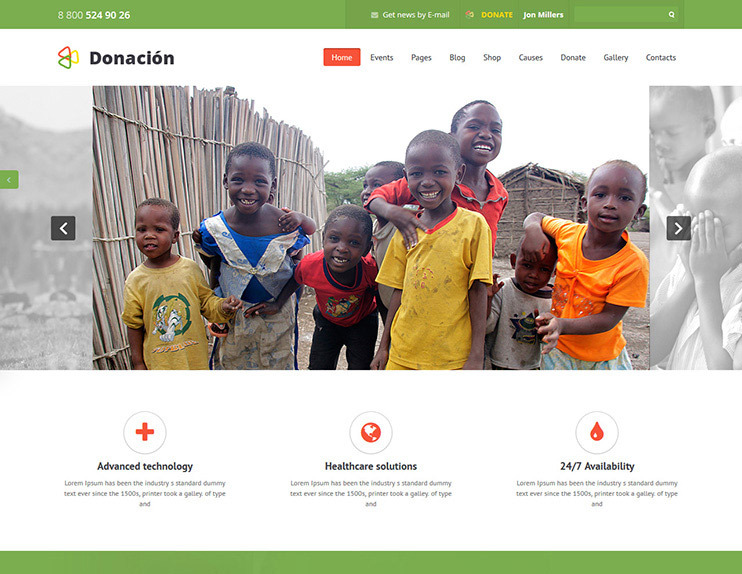 It is a perfect theme template for Charity and donation sites. Thanks for the effort on providing the huge lists. I need to create a site for our Foundation. Our welfare projects on education, healthcare, livelihood in rural development area. Also we required this site in multi language. Which theme would you recommended for our Foundation site. My personal favorites theme for this purpose is Pena and Generosity. This both the theme are suitable for your foundation site. Both the theme are compatible with the WPML plugin. So you can create your site in Multi language. Thanks Upendra for your recommendation. I like the Pena theme for my foundation site. Soon I will purchase this theme. Thanks for your feedback Frederick. Great themes, Thank you for giving us such a useful theme list for Charity themes. List is great. I was looking all over. Which theme will be best for my donations site. And I found one theme (Alone) from this list. Thanks for your feedback Johan. What could i say! A great list of charity websites. I am so much confused to choose the best one from this huge list of all very best charity themes. Really these all are best. 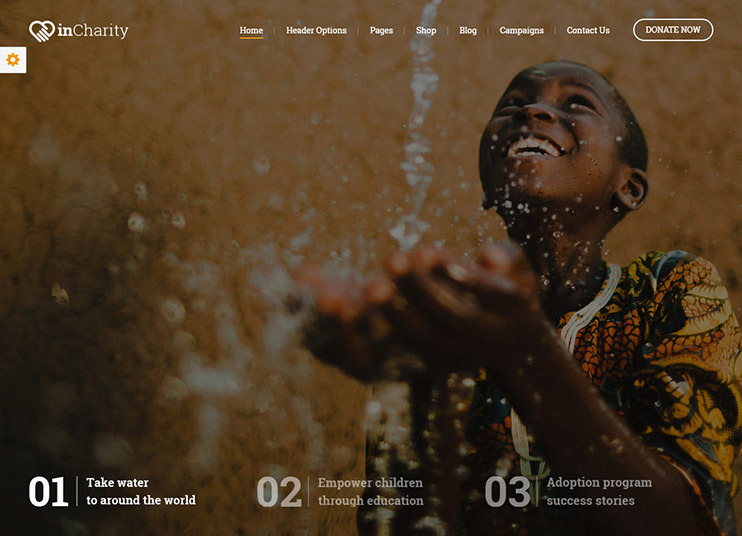 Though it is hard to choose from your list, but i manage myself to go with charity WP theme. It’s Campaign and event management feature i like mostly. Excellent stuff!! Thanks a lot for sharing these resources.